Over my freelancing years, I have seen that social networking websites are always in high demand. Almost everyday I could see a job offer posted to create a social networking website. Nobody is looking to compete with Facebook or Twitter, rather they are looking to have a social networking website for a specific community. For example, a website related to traveling would want a social networking website for its members. It is useless to develop a social networking from scratch. There are so many features involved that months would be spent on developing it. It is better to take a social networking script, and add features on the top of it, if required. I've included 3 PHP social networking scripts in this article - the 3 best ones I could find on CodeCanyon marketplace. All of them are similar to Facebook in functionality. They are premium scripts, and cost around $50. Premium scripts offer greater no of features as compared to free ones, and are far good-looking. You can also contact the developers for some support, which can be really helpful. 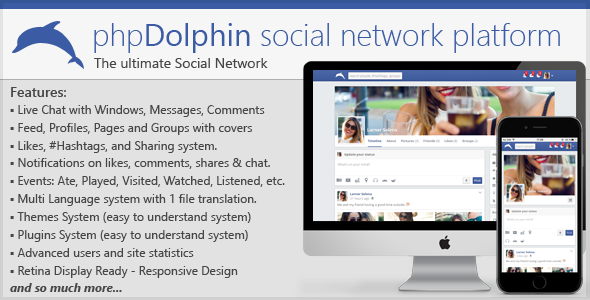 phpDolphin is a Facebook like social networking script released back in 2013. At the time of writing this article, 2300+ copies of this script have been sold. 375 customers have rated it, average rating being 4.7 / 5. It however does not have a follow-unfollow system, as of now. phpDolphin has a theme and plugin system. Through the theme system you can change the website design by uploading a new theme. Through the plugin system you can add custom features (just like Wordpress plugins). API Hooks have been provided, just like in Wordpress. Available API hooks have been steadily increased over time. Other social networking scripts also offer theme and plugin system, but that of phpDolphin's have been tested fairly well. Themes and plugins have been released both by the original author, and some 3rd party developers. If you are looking to add your own custom features on the top of basic social networking script, phpDolphin is a very good option. The author of this script has regularly updated the script and removed bugs, all over the years. Quite a no of times, some sections of code have been completely re-written. phpDolphin is the most trustworthy social networking script available on the CodeCanyon marketplace. An installation script is included in phpDolphin. Through the admin panel, you can manage users, groups, website configuration, change website themes, see reports, change language (script offers multilingual support) etc. During the support period, you can contact the developer to answer questions about the script, get assistance with bugs and 3rd party tools. Support does not include installation and customizations. However if you are stuck during installation, the author will definitely help you. He may install the script on your server for no extra charge. phpDolphin requires PHP 5.3+, MySQLi and GD Library. Any basic hosting service will provide these. However if you are enabling camera access (during photo capture), you will need a SSL certificate. Browsers allow a website to access the device camera only if the website is hosted on HTTPS. If you are looking for a hosting & SSL certificate for phpDolphin, I would recommend Dreamhost. Dreamhost provides a free SSL certificate, and also a free domain if you go for an annual plan. There are lot more features in phpDolphin. Checkout phpDolphin for the complete list of features. It also contains links to live demos of both the frontend and admin section. 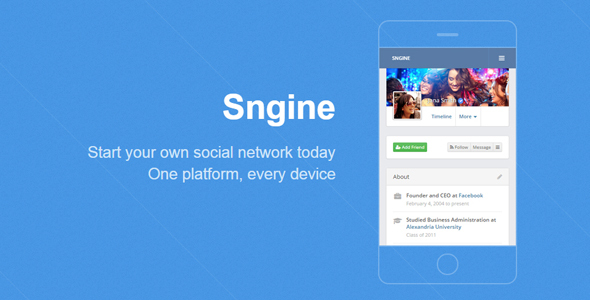 Sngine is also a Facebook like social networking script. 1000+ copies of this script have been sold. Its average rating is 4.9 / 5, with over 220 ratings posted. Sngine comes with Web-View apps for Android, iOS & Windows. Web-View apps are not native mobile apps, rather they just embed web pages within a mobile app. Anyways it is a useful addition. Sngine offers monetization options - subscription, membership, paid-only access for some sections. Billing can be done through Paypal, Credit Card and a few more providers. Sngine comes with an installer. Through the admin panel, you can manage registrations, users, groups, website configuration, website themes, see reports, translations etc. Basically you can control available features on the frontend through the admin panel. Snigne also support RTL languages like Arabic, Hebrew etc. Support does not include installation and customizations. However if you are stuck during installation, you can ask the author for help. Sngine requires PHP 5.4+, MySQLi, cURL and a few common PHP extensions. Any basic hosting service will fulfill all requirements of Sngine. If you are looking for a hosting provider for Snigne, I would recommend Dreamhost. Dreamhost provides a free SSL certificate, and also a free domain if you go for an annual plan. Checkout all features of Sngine. Make sure to check the live demo of the frontend. 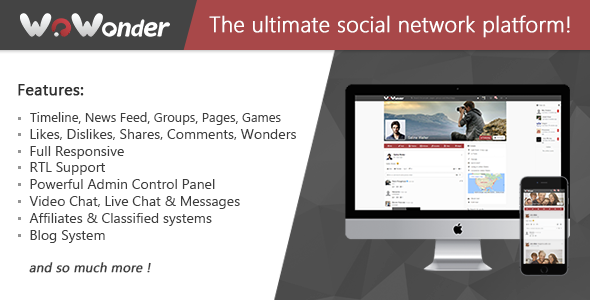 WoWonder is again a Facebook like social networking script. It has been sold over 1100+ times. Its average rating is 4.9 / 5, with over 230 ratings posted. WoWonder supports some extra features like Dislike button, adding replies to comments, sending files in private messages, playing flash games. Sngine comes with an installer. Through the admin panel, you can control most of the features available on the frontend. WoWonder also support RTL languages like Arabic, Hebrew etc. WoWonder requires PHP 5.5+, MySQLi, cURL and a few common PHP extensions. Any basic hosting service will fulfill all requirements. However enabling video calls will require a SSL certificate. Browsers allow a website to access the device camera only if the website is hosted on HTTPS. If you are looking for a hosting & SSL certificate for WoWonder, I would recommend Dreamhost. Dreamhost provides a free SSL certificate, and also a free domain if you go for an annual plan. WoWonder has more features. Checkout WoWonder for the complete list of features. It also contains the link to the live demo of the frontend.